If you love the blues or simply want to learn more about how to play great sounding blues chords on the guitar, this post is for you. Blues music originated in the deep south of the US around the end of the 19th century. Legendary blues artists such as BB King, Muddy Waters, Buddy Guy, etc are a few examples of musicians who greatly helped pioneer the creation and shaping of blues music. Blues music most times has a distinct sound and many recognize it by the well-known 12-bar blues progression. This progression is made up of 12 measures and is based on the I-IV-V chords of a key. 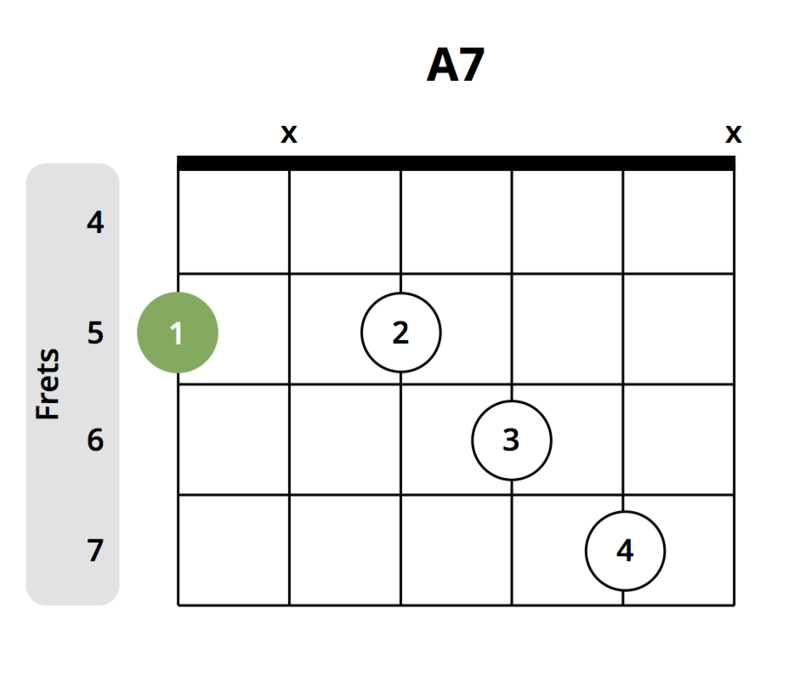 To help better understand the following example, I would recommend taking a read through the learning guitar scales and guitar chords posts. That being said, the 12-bar blues progression essentially uses the following formula. Once you get to step 6, simply rinse and repeat. As you can see by counting the measures, they add up to 12, hence the 12-bar blues. This post however, isn’t going to go overly in-depth into the history and advanced structure of the 12 bar blues. 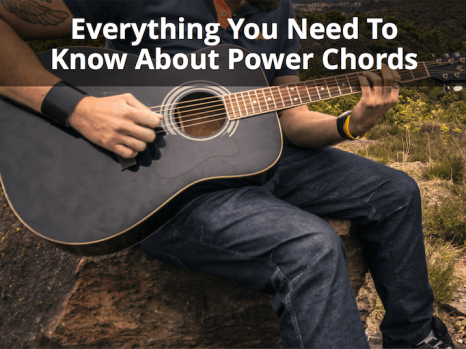 Rather this post is all about highlighting great sounding blues chords that you can add to your guitar playing toolbox. Learning the blues can truly open up a huge range of musical possibilities. Therefore, knowing which chords will produce a “bluesy” sound will help you further advance your blues playing skillset. What Makes a Blues Chord? You can play the blues with really any type of chord. For example, if you want to use all major chords you can simply take the chords A, D, and E, plug them into the 12-bar blues formula and voilà, you’ve got a blues chord progression. However, these chords aren’t necessarily blues chords per se. They are just regular major chords applied to a blues progression. Sometimes you may see a variation in the presence of these notes. For example, in some cases, there may be no perfect fifth or you may add a 6th, etc. However as long as the root, third, and 7th are present, then you still have a 7th chord. That being said, true blues chords aren’t restricted to just 7th chords, many times 9ths and 13ths are also used to provide that bluesy sound. There are a ton of possibilities and variations to blues chords. You can add certain notes to an existing blues chord to give it more flavour, you can change the key, etc. The important thing to note is that blues chords commonly use 7ths, 9ths, and 13ths, however, this is not a rule set in stone. The following list of 12 blues chords are all in the key of A. 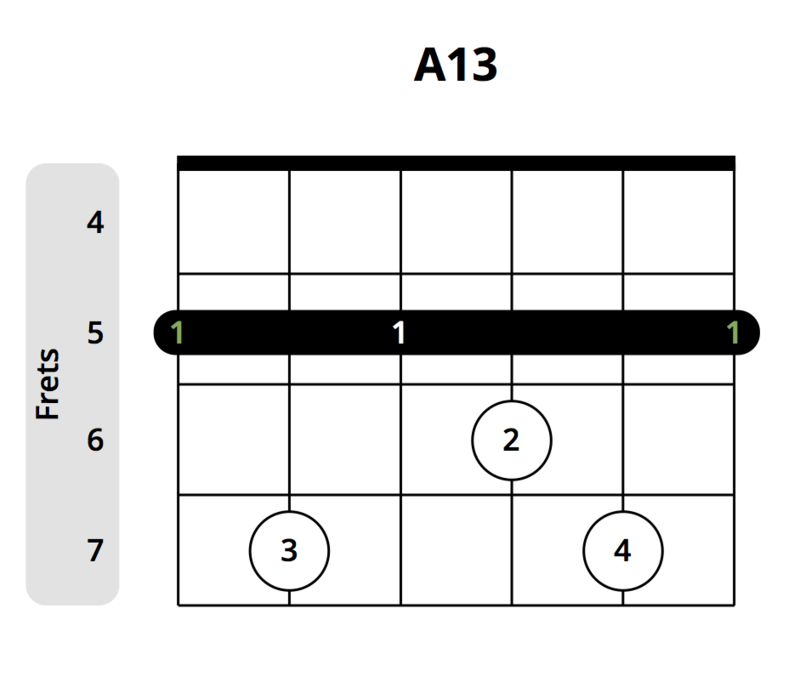 In the blues chord chart below I decided to include the positions of these chords in the key of A, D, and E so that you can pick and choose which chords you want and then apply them to the 12-bar blues progression (I’ll also discuss a few blues progression examples). The root of each of the following chords is highlighted in green. To change the key of each of the following chords take the lowest root and change its position on the fretboard while maintaining the same chord shape, just transpose all of the notes. For example, let’s take the first A7 chord. The root is found on the low E string on the 5th fret. To modify this chord to be in the key of D, simply move from the 5th fret of the low E string to the 10th fret, as well as all other notes accordingly. 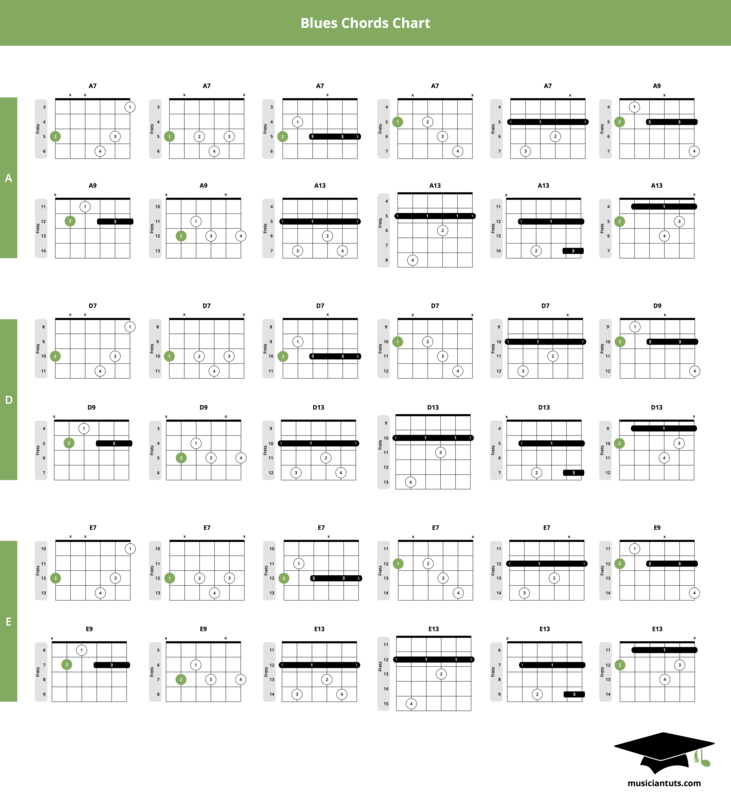 To see a complete view of a guitar’s fretboard notes, check out the guitar fretboard notes legend. You’ll also notice that in the list below there are multiple chords that are named the same. This is simply due to variations of the same chord. Try playing through all the blues chords below to see which ones you like the best. The following blues chords chart contains all of the chords listed above in the key of A. Additionally, it also includes the positions for playing the same chords in the key of D and E. Although these chords can be played in any key and are fully moveable, I have chosen to list the chord placements in the of A, D, and E since they follow the I, IV,V formula for playing a 12-bar blues progression. Once your chords are picked, you can apply them to the 12-bar blues formula above and you’ll have a basic blues progression. I’ll explain other more in-depth blues progression possibilities in the next section. When is comes to blues chord progressions, there are many other variations apart from what was outlined in the introductory section of this post. Although that is the basic form of the 12-bar blues, you can also switch it up. Using the chords and keys outlined in the blues chord chart above, here are a few blues chord progression examples you can try out for yourself. In each example, I’ve listed 3 components, the 12-bar blues pattern, the chords I’ve selected for each progression, as well as the chord diagrams for said progression. Try playing each chord progression listed below and also try coming up with your own combinations. With the chords in the blues chord chart above, you can pretty much interchange any chord and apply it to a particular 12-bar blues pattern. Although some chords may sound better together than others, no matter which variations you choose, they will all work. In this post, I’ve listed 12 blues chords that I enjoy playing and that sound great. However, these certainly aren’t the only blues chords that exist. There are many other variations you can use to create your own blues sound. For this, I’ve listed 3 tools below you can use to find new chords. Guitar Pro Chord Diagram – The Guitar Pro chord diagram can be used to discover new chords and even make your own. Simply open a new session and press “A” on your keyboard to open the chord diagram tool. From here you can select the key as well as any other options you’d like. 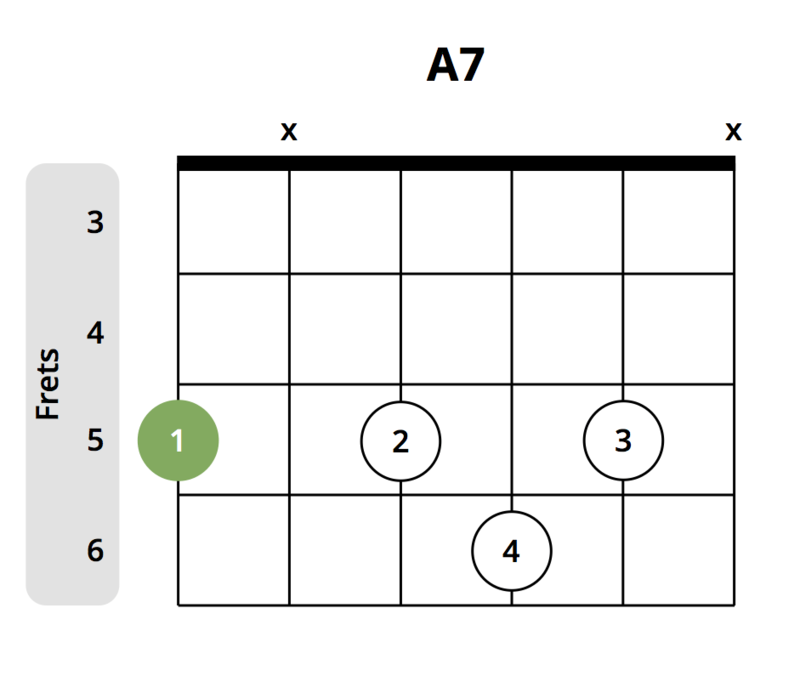 You can also customize any notes on the chord diagram yourself to create new chords. 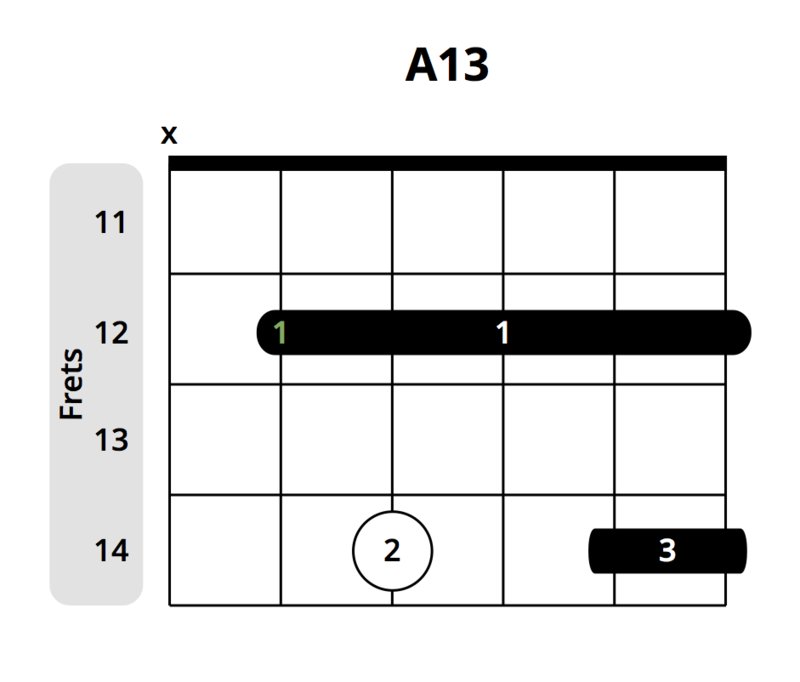 Tux Guitar Chord Diagram – Similar to the Guitar Pro chord diagram, Tux Guitar also allows you to see a full list of chords as well as create your own. Simply click on the chord diagram icon in the top navigation bar to open the tool. The features are quite similar to Guitar Pro’s tool. 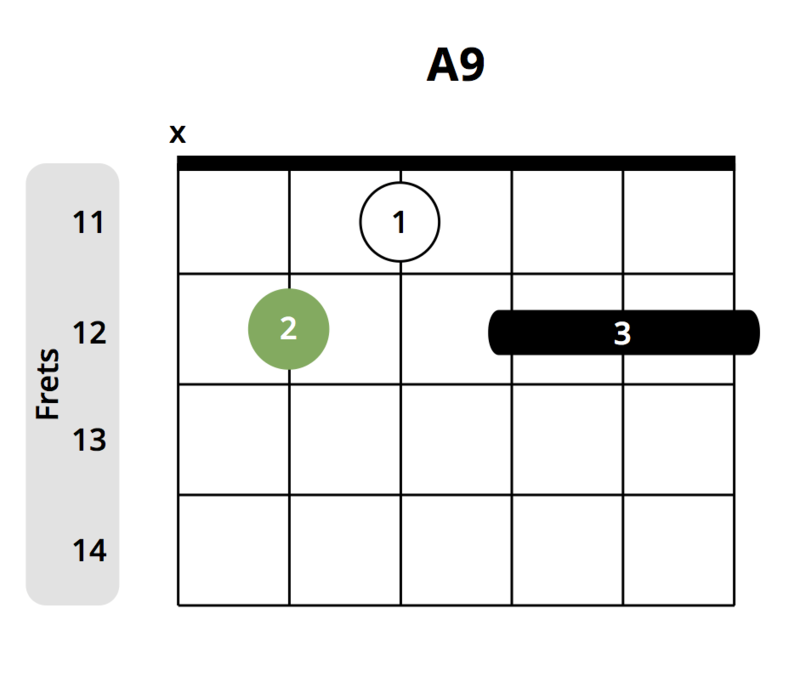 Guitartuna Chords – Lastly, if you want to check out guitar chords on your mobile device, you can use an app called Guitartuna. 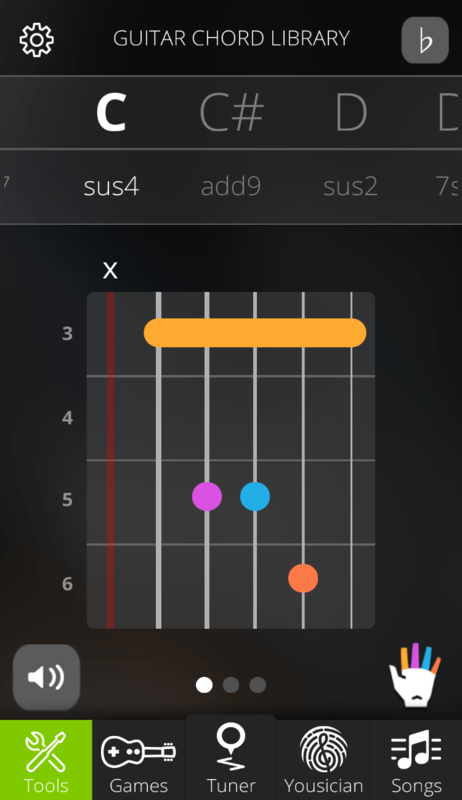 This app is primarily used for tuning your guitar, however also has a chord diagram feature that allows you to browse through their directory of guitar chords. Knowing the basics of blues music is an important skill to have not only as a guitarist but as a musician. Over the years it has been the birthplace for a ton of great songs and artists alike. Practicing the 12 blues chords mentioned in this post will provide you with a starting point for learning great sounding blues chords and example progressions. Remember to have fun with it and don’t forget to experiment with your own combinations. If you have any great blues chords that you really enjoy playing that I forgot to mention in this post, share them in the comments section below for others to see.